Panelists from left to right: Joe Linstroth, Jeff DeGraff, Eric Thomas, Lauren Bigelow, and Nate Lutz. Our Feb. 19 Issues & Ale conversation at Pretzel Bell in Ann Arbor. 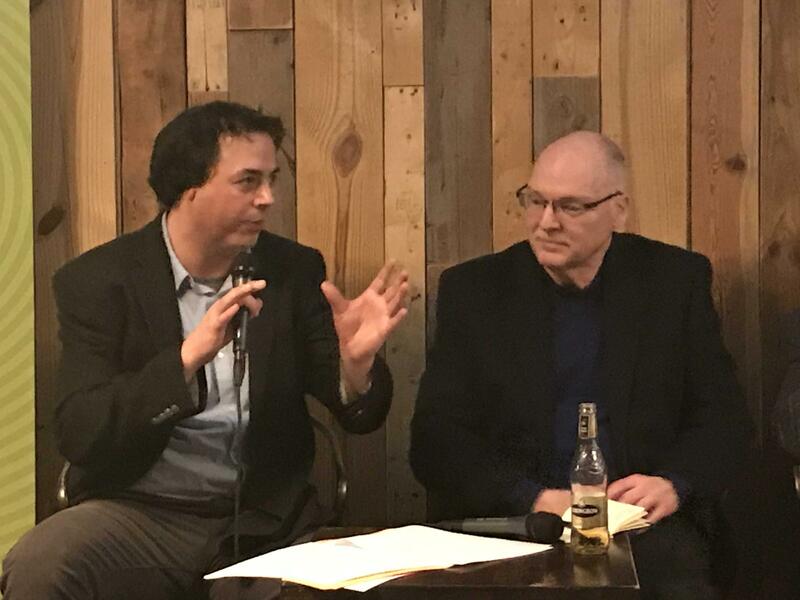 Michigan Radio's Joe Linstroth and Ross Business School professor Jeff DeGraff co-hosted the discussion. For more than three years, The Next Idea has been talking to people who took their creative ideas and turned them into something tangible — a business, an invention, social change. Those out of the box ideas are essential to keep moving Michigan’s economy forward. But creative ideas often get stuck in their own regional bubbles. As a send-off for The Next Idea, Michigan Radio got together to discuss how that regional isolation affects the state’s economic growth, why it matters, and what can be done about it. 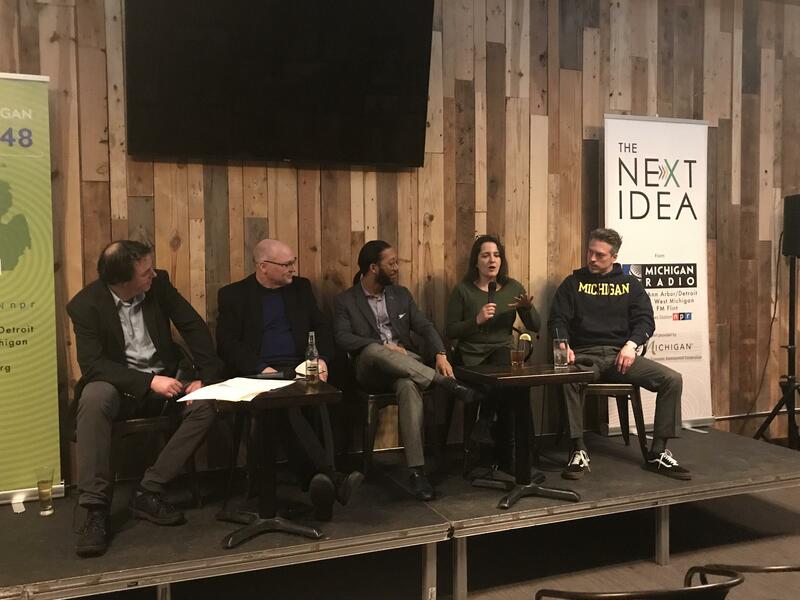 Michigan Radio’s Joe Linstroth and University of Michigan Ross School of Business professor and “Dean of Innovation”Jeff DeGraff were joined by a panel of business leaders and thinkers from across the state. Listen above to hear the panelists talk about how stereotypes of Michigan’s three largest cities get in the way of collaboration, why Michigan has a tough time retaining homegrown talent, and what the state would look like if we could pool our resources and innovation. The Next Idea’s parting words: Believe in your idea. It might just help move Michigan forward. In late November of 2014, Michigan Radio’s Stateside began a series called The Next Idea. With support from the Michigan Economic Development Corporation and a team that included the University of Michigan’s “Dean of Innovation” Jeff DeGraff and Executive Producer Joe Linstroth, the project’s mission was to focus on innovation, creativity and ideas meant to move Michigan forward. In essays and interviews, we met Michigan inventors and entrepreneurs, teachers, artists, scientists, farmers, business people, experts, and just regular citizens who decided to think outside the box to make their state and their communities better. Michigan has the parts to build a powerful economic engine. They just need to be connected. Well, it’s been three years since we started The Next Idea. The aim of the project was to showcase the wide array of amazing people and communities here in Michigan, and how they make innovation happen every day, everywhere, and in every way. Looking back, we have heard the diverse voices and perspectives of artists, educators, community leaders, executives, entrepreneurs, and inventors; the young and old and everyone in between from all the regions of the Great Lakes State. Anyone looking for creative ideas, domain expertise, or best practices for innovation need only search the hundreds of essays and interviews on The Next Idea page. Collectively, they contain a blueprint for moving our state forward.